The Haute Route, a.k.a the High Route or Mountaineers’ Route between Chamonix, France and Zermatt, Switzerland is “the mother” of all hut-to-hut alpine traverses. From Europe’s tallest mountain, the Mont Blanc (4807 m= 15770ft.) to the Matterhorn, our route leads along some of the most exciting mountain scenery to be found anywhere. Contrasting the huge glaciers and rugged peaks are beautiful valleys with steep high pasture farms and quaint mountain villages. The highest point of the Haute Route is the summit of the Tete Blanche at 3800m (=12500 ft). After spending a week high in the mountains, walking down Zermatt’s bustling main street will feel like returning into a different world. We will lodge in remotely and spectacularly located huts of the Swiss Alpine Club. The food is good and plentiful, the dormitories clean – but you should be able to survive without a hot shower for three days until we hit the hotel mid way through the trip in Arolla. With a week of acclimatizing on the Haute Route under your belt, why not take two more days and try the Mont Blanc, the Alp’s highest peak. Strenuous alpine trekking. 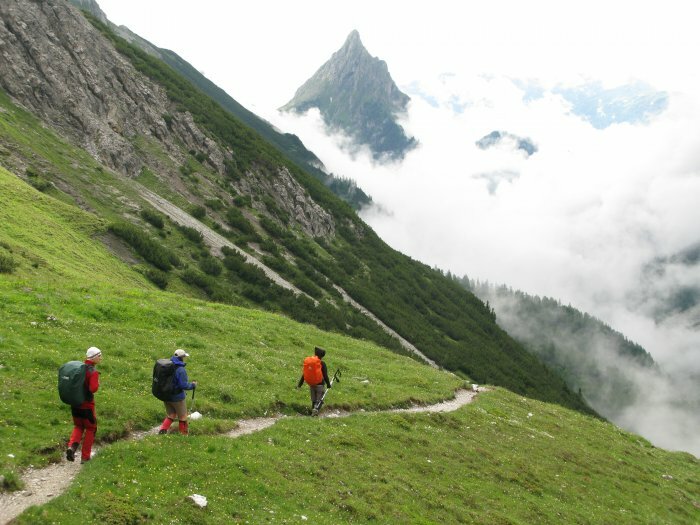 Although technically not very difficult, the trip requires up to 9 hrs of hiking – mostly uphill and at times on rough, steep trails and on glaciers, where you will be roped up with fellow hikers and your guide. The use of crampons might sometimes be required (Introduction and training day on the first day of the trek!). Relative to multi-day treks in most parts of the world, your backpacks will remain relatively light (5 – 8 kg = 11 – 18 lbs) as we don’t have to carry food (other than snacks), a sleeping bag and no cook ware or fuel. We recommend a backpack size of 35 – 45 liters (2100 – 2700 cubic inches). 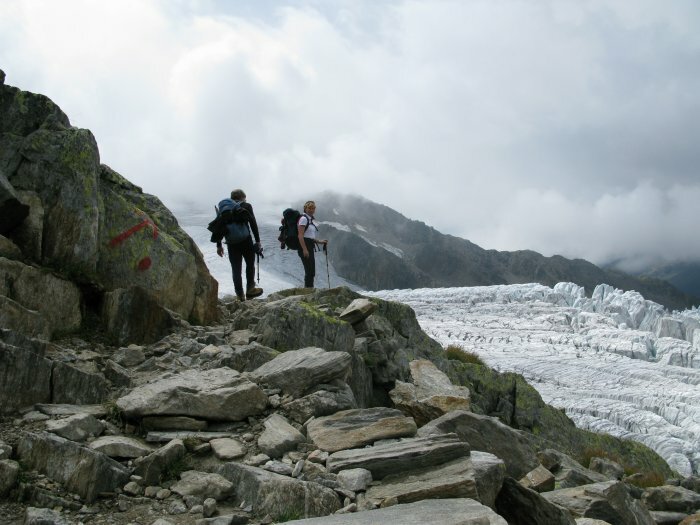 The Haute Route Glacier Trek is also referred to as the Mountaineer’s Route and should not be confused with the so called Hiker’s Haute Route, which is a low level traverse on hiking trails with lodging mainly in hotels rather than high altitude huts. The Mont Blanc ascent is technically more difficult than the Haute Route, implies more objective dangers and requires a client to guide ratio of two to one. This trip extension is very popular with our clients! Travel day. Meet in the evening in Argentiere for equipment check and familiarization with group participants. Gondola and chair lift rides to the Col de Balme (2000m = 7200ft). Beautiful hike with views of Mont Blanc and the Chamonix Valley to the Albert Premier Hut (2705m= 8870ft) for Lunch. In the afternoon introduction in safe glacier travel, use of crampons and ice axe. 500m=1640ft climb, 4 km, 2.5 hrs of hiking time to the hut. Early morning start (5 AM) and Via the Glacier du Tour to Col Superieur du Tour (3300m = 10,800ft), which marks the border to Switzerland. Beautiful views of the whole Mont Blanc range. Descent via the Glacier du Trient, Glacier Orny to the Cabane Orny (2830m = 9,300ft) where we spend the nite. 6 hrs travel. where a taxi ride up the quaint Bagne Valley to the Mauvoisin Lake (1850m = 6070ft). From here we hike along the lake and up the beautiful meadows to the Chanrion Hut. 6.5 hrs. walking. From the Chanrion Hut we follow the long and easy Oetema Glacier to the short rocky slope leading up to the Vignette Hut (3,160m = 10,360f where we have lunch. Then down the glacier and then steeper trail to the quaint village of Arolla for our nite in the beautifuly situated l Hotel Kurhaus. ( dbl rooms w/ showers) 6.5 hrs walking. A scenic glaciated valley leads to the trail ascending to an unguarded shepherd’s hut at Plan de Bertol (2670m = 8,750ft) and from there steeply across a small glacier and the last 250 meters (800ft on ladders and chains to the Bertol Hut (3310m = 10860ft), one of the most spectacularly located huts in the Western Alps. 900m = 2,950ft climb, 740m = 2,400ft descent, 12 km = 6 hrs walking. Ascent of the Tete Blanche ( 3,725m = 12,220ft) with marvelous views across the whole route all the way from the Mont Blanc to the Matterhorn. Impressive glaciated descent right underneath the 4000ft north faces of the Matterhorn (4480m=14700ft) and the Dent d’Herens to the Schonbiel Hut (2700m=8856ft). 600m=1,970ft climb, 1,280m=4,200ft descent, 11 km, 7 hrs of walking. All downhill today: On well-marked trails via the hamlet of Zmutt with plenty of opportunities for postcard shots of the Matterhorn all the way to Zermatt. 1,100m = 3,600ft descent, 10km, 3 hrs). The trip usually finishes after lunch together, however many of our clients prefer to stay in Zermatt, in which case we offer to arrange and add additional hotel lodging to your trip itinerary. We can have a luggage shuttle organized to bring your bags from Chamonix to Zermatt. 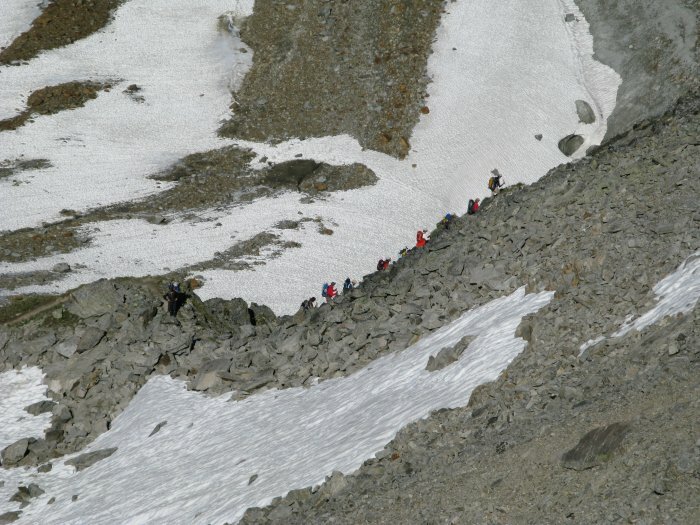 Day 7 and 8 can also be connected in a long day of hiking and sometimes groups prefer to descend all the way into Zermatt right away, in which case we will cover the lodging in Zermatt with breakfast in a two star hotel instead of the night in the Schoenbiel Hut. This option is only suitable for strong groups. A mid-trip stay in a nice hotel in Arolla provides a break from the dorms in the high level huts and not to mention the rejuvenating effects of a warm shower! The itinerary can also be done in 6 days of hiking but by splitting up the last day we maintain the option to finish the trip even if bad weather should prevent us from hiking on one of the days. 6PM on the travel day or 8 AM on the first trekking day in Argentiere, about 15 min. up valley from Chamonix. High season for all mountaineering in the western Alps is mid-July through August.